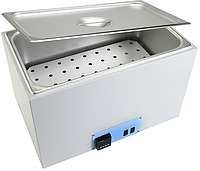 This circulating water bath is fully insulated with magnetic circulator for heating up to 12 4" diameter Marshall samples at a time. Perforated bottom support shelf allows free circulation of 2" of water above and below molds. Temperature controls from ambient to 180° F (82° C), accuracy of + 0.1% of input span. Dual-digital display simultaneously shows set point and process temperature. Volume: 7.76 gal. (29.4 L).